Pleased to meet you, your grace. I'll post my progress on the Atala. 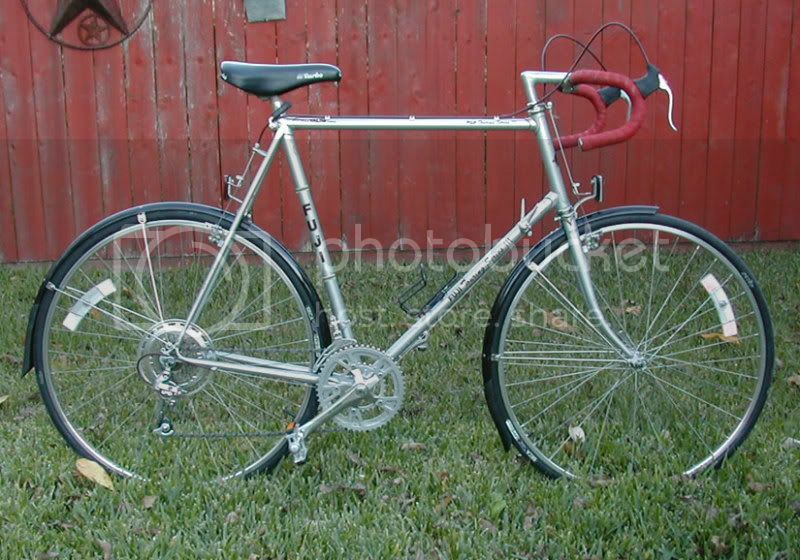 Finding this frame and resurrecting it is pennance for me getting my father's Atala Grand Prix stolen about 15 or 16 years ago. Meet my new acquisition. 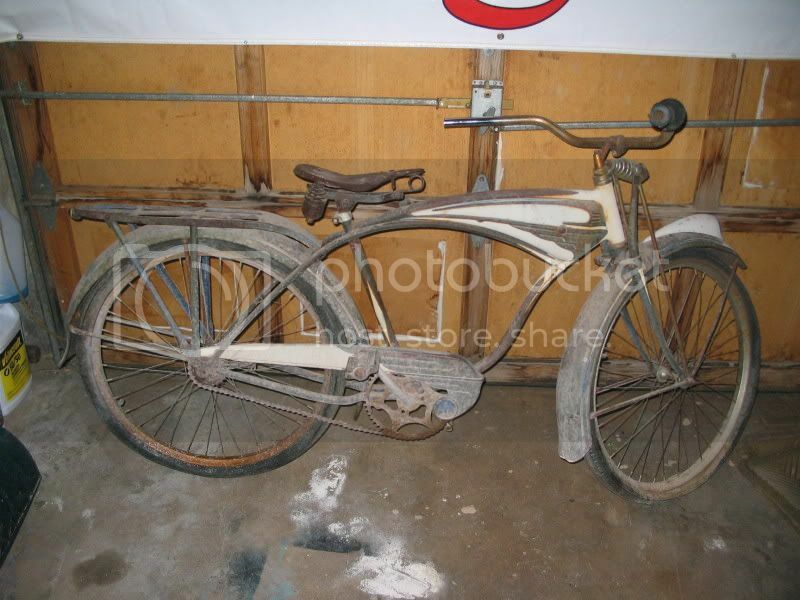 You can't see the name in the pics but there is a SCHWINN title on it. Unfortunately the badge on the front is gone. This bike has been sitting behind a shed for years! I don't know much about older Schwinns.... do you know what model it is? It looks kinda like the one my Mom had. It's a gorgeous bike (or rather, it WILL be a gorgeous bike) with nice lines. Check for the S/N location, if it's on the BB it's very early. If on the left dropout, a little later like I think it is. Regular pitch chain says mid fifties too IIRC. Wow, that bike is really cool. I don't know, but with all the detail it looks like it may have been a pretty nice bike, at least it doesn't look like a cheapo. Looks like a candidate for oxalic acid for sure, search it if your not familiar, the process is cheap and has saved me a ton of painstaking labor. I looove the look of this bike, good luck and post your progress! That's what I was thinking (since we've carried PB before), but I wasn't sure. I remember that they were easy to install, and seemed pretty secure. 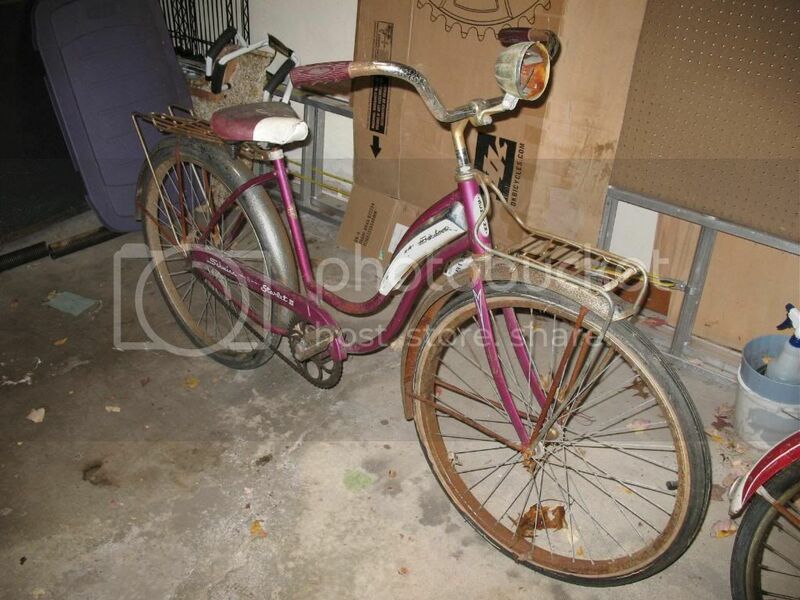 Funrover, you may want to ask around on the forums at schwinn.com about this bike. Someone may know exactly what you have. Looks a lot like a Phantom. Took some days off and talked myself into going delivering some of my old and hopeless frames (and some garbage) to a free delivery place here in Oslo. Ended up dumpster diving for this little cute bicycle. 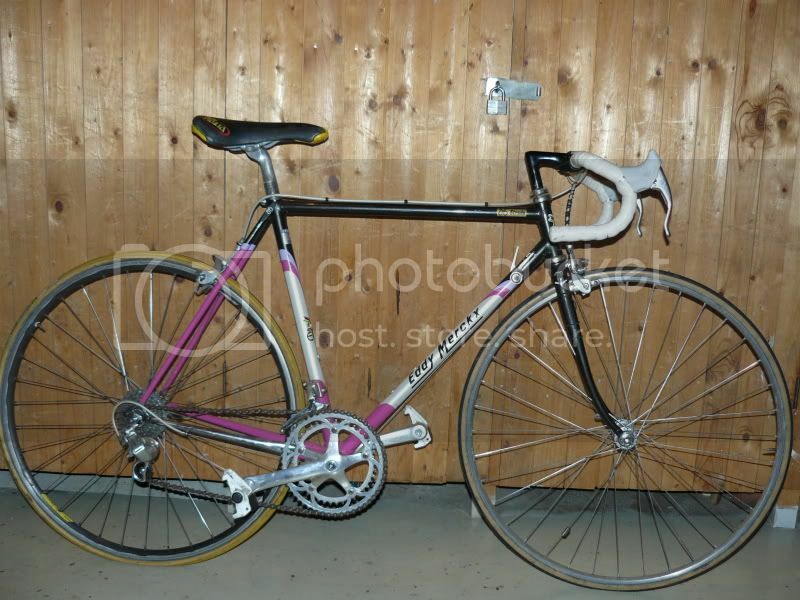 An Eddy Merckx Strada with almost complete Athena. Rear wheel is Shimano 105. Rear spacing is 130. Too small for me at 52,5 cc. I even spoke to the lady who did so, and told her that the bike was worth some money. It was given to me by the guy who took care of the bicycle dumpster. (we had a nice chat about bicycles before she came). She said she just didn't care and it had not been used for many years. Oooooh! My size! Me likey!! BD, That Fuji is lovely. I very much like what you did with it. Also, I have a roll of red housing that would likely match the bar wrap. PM me if interested and I'll send you some. Last edited by High Fist Shin; 12-12-08 at 10:52 AM. 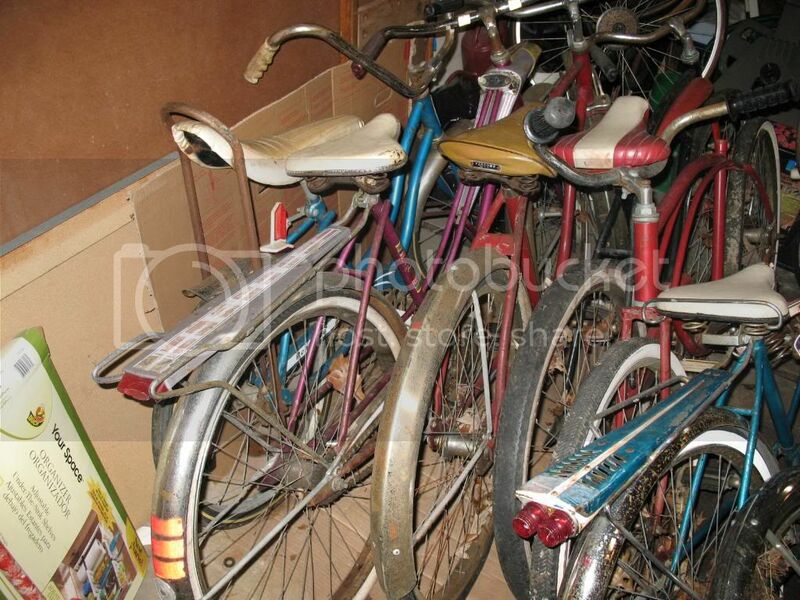 What dumpster did that Eddy Merckx come out of? I have my travel agent on the phone, and need to know what airport to fly into! "Machinshin" how are those fenders on the Fuji working out for you? I was thinking about ordering the SKS fenders from Nashbar. Easy installation? Fit on securely? Sorry, those are Bikedued's fenders and his Fuji. The only Fenders I have experience with installing are Honjos. They are a time consuming install but look amazing when finished. I need to get one of those front racks and an appropriate bag of some sort. 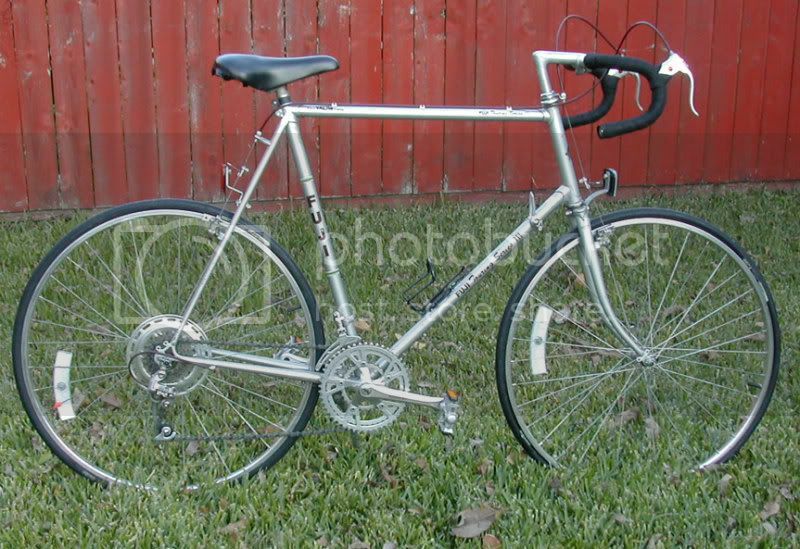 I'm hoping to start doing the randonneur thing this year. Super randonneur is several years off, I'm afraid. Anyway....damn that bike is gorgeous. Schwinn Starlet 3, SchwinnTiger 3 speed, black framed men's Schwinn middle weight missing decals, Monark Silver King American, Rollfast Deluxe (women's) and some others. It looks like the Tiger 3 speed is from 1954 and has an alloy shell SA/AW rear hub. The serial number is L93011. If you see anything you want let me know as all of this was bought to flip. Last edited by sonatageek; 12-12-08 at 08:23 PM. 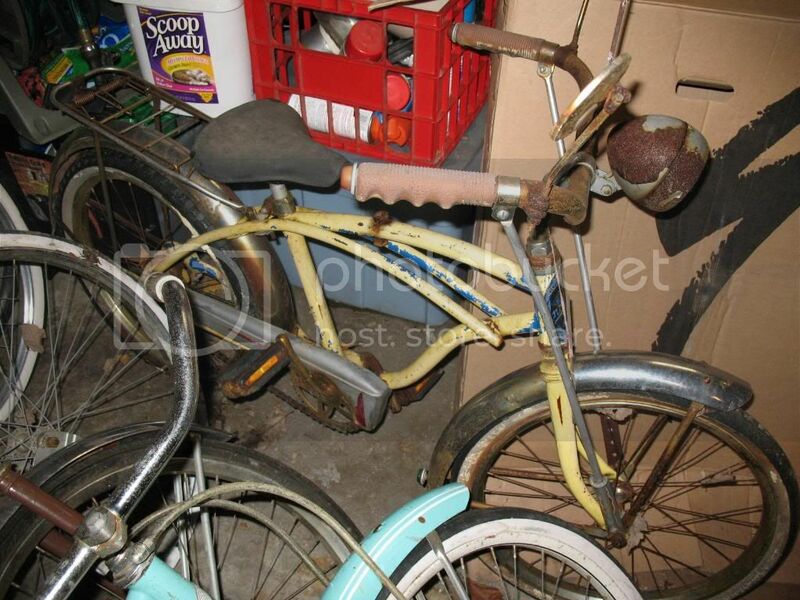 I've acquired another "doomed for the junk yard" bike. I think I'm probably going to fix this one up for the step-kid. He can destroy a mountain bike, so I'm not going to buy him a "good" road bike. I figure it'll be hard to destroy this one.
. I'm not sure on the year - I haven't checked date codes yet - but I think it's around 1980. Appears 1980 might be spot on. Man, look at that GIANT chainring on the red Murray!!! It's got to be at least a 50!? Humongous, hehe. The fenders are great! No rattles, and look pretty good too...Not to mention they're probably as light as alloy fenders. No complaints. I want to get a set of the mudflapped models for the Moto Grand Touring. Black will look fine on it as well since it is charcoal with black head tube and seat tube bands. I may break down and get a set of Honjos for the Grand Record if it has room. Not sure about the SKS, anyone else have any experience with them? Last edited by Bikedued; 12-12-08 at 05:46 PM.